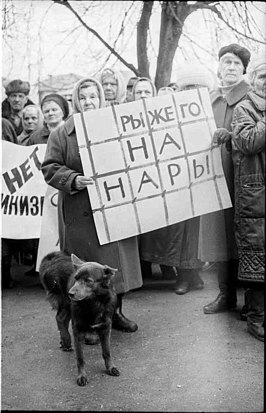 Russians protest the economic depression caused by the reforms with the banner saying: "The redhead should be in jail! ", 1998. Privatization in Russia describes the series of post-Soviet reforms that resulted in large-scale privatization of Russia's state-owned assets, particularly in the industrial, energy, and financial sectors. Most privatization took place in the early and mid-1990s under Boris Yeltsin, who assumed the presidency following the dissolution of the Soviet Union. Private ownership of enterprises and property had essentially remained illegal throughout the Soviet era, with Soviet communism emphasizing national control over all means of production but human labor. Under the Soviet Union, the number of state enterprises was estimated at 45,000. In the later years of the Soviet Union, Mikhail Gorbachev relaxed restrictions on private property and introduced initial market reforms. Privatization shifted Russia from the Soviet planned economy towards a market economy, and resulted in a dramatic rise in the level of economic inequality and a collapse in GDP and industrial output. Privatization facilitated the transfer of significant wealth to a relatively small group of business oligarchs and New Russians, particularly natural gas and oil executives. This economic transition has been described as katastroika (combination of catastrophe and the term perestroika) and as "the most cataclysmic peacetime economic collapse of an industrial country in history". A few "strategic" assets, including much of the Russian defense industry, were not privatized during the 1990s. The mass privatization of this era remains a highly contentious issue in Russian society, with many Russians calling for revision or reversal of the reforms. In the late 1980s, as part of the perestroika reformation movement, legislation championed by Mikhail Gorbachev—who pledged to build a "mixed socialist economy"—effectively transferred some controlling rights over enterprises from the government to the employees and management. In 1987, over the opposition of some of his allies, Gorbachev succeeded in passing a "law on state enterprise" through the Supreme Soviet of the Soviet Union, which granted work collectives a greater role in running enterprises. In 1988, the Law on Cooperatives legitimized "socialist cooperatives," which functionally operated as private companies and were permitted to directly deal with foreign companies, and reduced reliance on central planning. Later that year, private Soviet farmers were permitted to rent land from the state, purchase equipment, and hire workers, a significant step away from mandated collective farming following decades of dominance by state-owned agricultural concerns. The new regulations were seen as an effort to break state farms into smaller units and address critical food shortages in the Soviet Union. The legislation also enabled these enterprises to withdraw from associations on their own, which led to the process of so-called spontaneous privatization in which control over some industrial assets was acquired by their managers. However, this accounted for only several thousand enterprises, a small fraction of the Soviet industry. In September 1990, the Soviet parliament granted Gorbachev emergency privatization powers, including the authority to transform state enterprises into joint-stock companies with shares offered on stock exchanges. One of the largest privatization efforts during the Soviet era was the transformation of the Ministry of Fuel and Energy into a joint stock company known as Rosneftgaz in September 1991. In the months before the dissolution of the Soviet Union in December 1991, soon-to-be president Boris Yeltsin began assembling a team of economic reformers led by Yegor Gaidar, then a young reformist economist, and including Anatoly Chubais. The reform team initially considered Swedish social democracy as a model for Russia, but Gaidar opted instead to study Hungary as a template and was influenced by Poland's use of shock therapy. Both Gaidar and Chubais were convinced that despite Russia's uniquely non-capitalist economic history, a market economy could successfully take hold in the country. Following the August 1991 coup d'état attempt, the economic situation in the country dramatically worsened and an acute food shortage emerged. In October, Yeltsin delivered a speech in which he declared that price controls would be lifted on January 1, 1992, over Gaidar's recommendation that no specific date for the freeing of prices be given. Privatization took place on a much wider scale in the early 1990s, when the government of Russia deliberately set a goal to sell its assets to the Russian public. Upon the Soviet Union's collapse, the new government was forced to manage the huge and inefficient state enterprise sector inherited from the Soviet economy. Privatization was carried out by the State Committee for State Property Management of the Russian Federation under Chubais with the primary goal being to transform the formerly state-owned enterprises into profit-seeking businesses, which would not be dependent on government subsidies for their survival. To distribute property quickly and to win over popular support, the reformers decided to rely mostly on the mechanism of free voucher privatization, which was earlier implemented in Czechoslovakia. The Russian government believed that the open sale of state-owned assets, as opposed to the voucher program, would have likely resulted in the further concentration of ownership among the Russian mafia and the nomenklatura, which they sought to avoid. Nevertheless, contrary to the government's expectations, insiders managed to acquire control over most of the assets, which remained largely dependent on government support for years to come. From 1992 to 1994, ownership of 15,000 firms was transferred from state control via the voucher program. Thus, although several of the initial objectives had not been fully achieved by the end of the vouchers program, a great deal of assets did fall into private ownership remarkably quickly and worked to provide some basis for market competition. Voucher privatization took place between 1992-1994 and roughly 98 percent of the population participated. The vouchers, each corresponding to a share in the national wealth, were distributed equally among the population, including minors. They could be exchanged for shares in the enterprises to be privatized. Because most people were not well-informed about the nature of the program or were very poor, they were quick to sell their vouchers for money, unprepared or unwilling to invest. Most vouchers—and, hence, most shares—wound up being acquired by the management of the enterprises. Although Russia's initial privatization legislation attracted widespread popular support given its promise to distribute the national wealth among the general public and ordinary employees of the privatized enterprises, eventually the public felt deceived. Privatization of the oil sector was regulated by presidential decree No.1403 approved on November 17, 1992. Vertically integrated companies were created by joining some oil-producing enterprises and refineries into open-stock companies. Starting in 1994 many former state oil companies were privatized. This privatization has been partial because the federal government has obtained ownership positions in several companies and has also retained full control over the transport of oil onto lucrative world markets. In 1995, facing severe fiscal deficit and in desperate need of funds for the 1996 presidential elections, the government of Boris Yeltsin adopted a "loans-for-share" scheme proposed by banker Vladimir Potanin and endorsed by Anatoly Chubais, then a deputy prime minister, whereby some of the largest state industrial assets (including state-owned shares in Norilsk Nickel, Yukos, Lukoil, Sibneft, Surgutneftegas, Novolipetsk Steel, and Mechel) were leased through auctions for money lent by commercial banks to the government. The auctions were rigged and lacked competition, being largely controlled by favored insiders with political connections or used for the benefit of the commercial banks themselves. As neither the loans nor the leased enterprises were returned in time, this effectively became a form of selling, or privatizing, state assets at very low prices. From 2004 to 2006, the government took control of formally privatized companies in certain "strategic" sectors. oil, aviation, power generation equipment, machine-building and finance. For example, the state-owned defense equipment company Rosoboronexport took control of Avtovaz, the primary producer of Russian cars. In June 2006, it took 60% control of VSMPO-Avisma, a company that accounts for two-thirds of the world's titanium production. In 2007, United Aircraft Building Corporation, a company that is 51% government controlled, combined all of the Russian companies producing aircraft. In December 2010, Russian President Dmitry Medvedev had ordered regional governments to decide on privatization of non-core assets by July 2011. Arkady Dvorkovich, then a top Kremlin economic aide, said regional privatization proceeds could amount to several billion rubles in 2011, and regional authorities must prioritize the sale of utility companies, financial institutions, manufacturing and transportation assets and the media. On May 2012, after becoming prime minister, Medvedev said Russia should carry out its privatization program regardless of market volatility. After a session of the World Economic Forum in October 2012, Medvedev said "It is vital for our country to continue the course towards privatization". He stressed that had assured participants in the World Economic Forum session that "does not want to see an economy totally controlled by the state". In October 2010 the Russian government approved a plan to privatize a wide range of state property from energy to agriculture and banking to transportation. ^ Hoffman 2001, p. 185. ^ Jeffrey Sachs (May 1992). "Privatization in Russia: Some Lessons from Eastern Europe" (PDF). AEA Papers and Proceedings. ^ Holmstrom, Nancy; Richard Smith (February 2000). "The Necessity of Gangster Capitalism: Primitive Accumulation in Russia and China". Monthly Review. Monthly Review Foundation. 51 (09). ^ Freeland 2000, p. 73. ^ "A Way with Words - katastroika". Retrieved 27 June 2015. ^ Milne, Seumas (16 August 2001). "Catastroika has not only been a disaster for Russia". The Guardian. Retrieved 17 September 2011. ^ a b Michael Parks (August 27, 1988). "Reforms to End Soviet Farm Collectivization". Los Angeles Times. Retrieved July 26, 2016. ^ Bill Keller (June 4, 1987). "New Struggle in the Kremlin: How to Change the Economy". New York Times. Retrieved July 26, 2016. ^ "Law of the Union of Soviet Socialist Republics on state enterprises (amalgamations) [LS 1987 - USSR 1]". June 30, 1987. Retrieved July 26, 2016. ^ William J. Frenkel (May 1989). "Union of Soviet Socialist Republics: Law on Cooperatives". International Legal Materials. 28 (3): 719–753. JSTOR 20693328. ^ Jeffrey M. Hertzfeld (1991). "Joint Ventures: Saving the Soviets from Perestroika". Harvard Business Review. ^ Hoffman 2001, pp. 177–178, 182, 184. ^ Hoffman 2001, pp. 183–184. ^ Nellis, John (June 1999). "Time to Rethink Privatization in Transition Economies?". Finance & Development. 36 (2). ^ Appel, Hilary (December 1997). "Voucher Privatisation in Russia: Structural Consequences and Mass Response in the Second Period of Reform". Europe-Asia Studies. 49 (8): 1433–1449. ^ Hanson, Philip. "The Russian Economic Puzzle: Going Forwards, Backwards, or Sideways?" International Affairs. 83(5), p. 876-877. ^ Sputnik (7 December 2010). "Medvedev orders regions to adopt privatization plans by July". Retrieved 27 June 2015. ^ "Medvedev: Privatizations Should Be Carried Out Regardless Of Mkt Volatility", Wall Street Journal, May 21, 2012. ^ "TASS: Archive - Medvedev confirms course towards privatization of state property". TASS. Retrieved 27 June 2015. ^ Sputnik (21 October 2010). "Russian government approves 5-year privatization plan". Retrieved 27 June 2015. Hoffman, David E. (2001). The Oligarchs: Wealth and Power in the New Russia. New York, NY: PublicAffairs. ISBN 978-1-58648-001-1. Freeland, Chrystia (2000). Sale of the Century: Russia's Wild Ride from Communism to Capitalism. New York: Crown Business. ISBN 978-0812932157. Carol S. Leonard and David Pitt-Watson, "Privatization and Transition in Russia in the Early 1990s". (Oxford, UK: Routledge, 2013). ISBN 978-0-415-55608-8. Andrew Barnes. "What's the Difference? Industrial Privatisation and Agricultural Land Reform in Russia, 1990-1996". Europe-Asia Studies, Vol. 50, No. 5 (Jul., 1998), pp. 843–857. Hilary Appel, "Voucher Privatisation in Russia: Structural Consequences and Mass Response in the Second Period of Reform". Europe-Asia Studies, Vol. 49, No. 8 (Dec., 1997), pp. 1433–1449. Paul L. Joskow, Richard Schmalensee, Natalia Tsukanova & Andrei Shleifer. "Competition Policy in Russia during and after Privatization". Brookings Papers on Economic Activity. Microeconomics, Vol. 1994, (1994), pp. 301–381. Pekka Sutela [fi], Insider Privatisation in Russia: Speculations on Systemic Change. Europe-Asia Studies, Vol. 46, No. 3 (1994), pp. 417–435. Roman Frydman, Andrzej Rapaczynski & John S. Earle, The Privatization Process in Russia, Ukraine and the Baltic States (Budapest: Central European University Press, 1993). Růžena Vintrová, "The general recession and the structural adaptation crisis", Eastern European Economics, Vol. 31, No. 3 (1993). Simon Johnson & Heidi Kroll, "Managerial Strategies for Spontaneous Privatization", Soviet Economy, Vol. 7, No. 4 (1991), pp. 281–316. This page was last edited on 5 March 2019, at 21:14 (UTC).